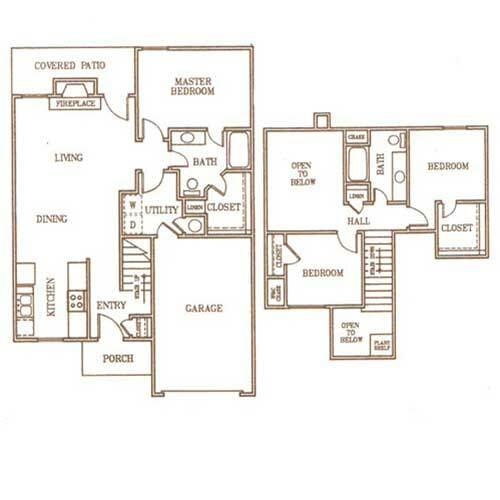 Fox Hollow Townhomes are spacious with three- or four-bedroom layouts. Every floor plan features an attached garage, a patio, a fireplace, and a large kitchen. Other features include breakfast bars, storage space, walk-in closets, and utility rooms with washer/dryer connections. 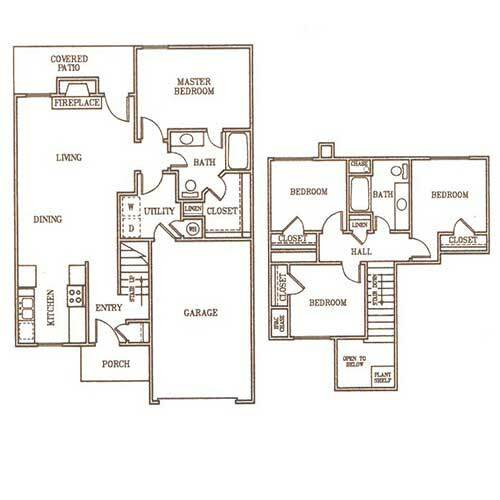 This is a four-bedroom, two-bath split floor plan with 1,693 square feet of living space. The garage includes a storage closet and has an entrance located off the utility room. The master bedroom has a walk-in closet and en suite bathroom. The open living area includes a dining nook. The covered patio is located off the G-shaped kitchen with breakfast bar. 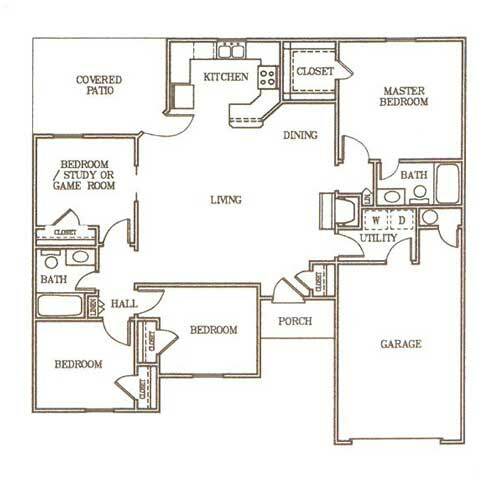 The two additional bedrooms and guest bathroom are located on the opposite side of the floor plan. A flexible room could be used as a fourth bedroom, a study, or a game room. This four-bedroom, two-bath, two-story townhome has 1, 598 square feet of living space. The main level includes the garage, front porch, utility room with garage access, a great room, and a galley-style kitchen. The master is on the main level and includes private bath access and a walk-in closet. The covered patio is located off the living room. The upper level contains the three additional bedrooms and a full bathroom. 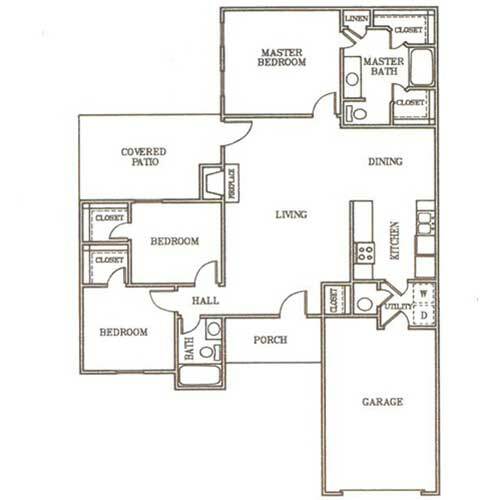 Plan C is a three-bedroom, two-bath floor plan with 1,593 square feet of living space. This townhome has an open living and dining area, a master suite with large bathroom and two walk-in closets, and a galley-style kitchen. The covered patio is located off the living room. The two additional bedrooms also have walk-in closets. The attached garage has access to the pass-through utility room, which leads into the kitchen. This three-bedroom, two-bath townhome has 1,558 square feet of living space. This floor plan features a private front porch, a living room with fireplace, a galley-style kitchen, and a separate dining area. The covered patio is located off the dining room. The master suite includes a private bath and walk-in closet. The attached garage has a private entrance near the utility room. This 1,534-square-foot, two-story townhome features three bedrooms and two bathrooms. The lower level features an open great room with fireplace, a galley-style kitchen, and the covered patio. The garage has access to the utility room, while the front porch leads into the foyer. The master is on the main level and includes private bath access and a walk-in closet. The upper level is open to below and features the two additional bedrooms – one with a walk-in closet – and a full bathroom.